Hi there, paints flying and a bit of ink too. These are some ornaments I painted using an e-pattern I got from my friend Marie over at Marie's Country Woodcrafts. Marie does beautiful painting and cuts her own wood. 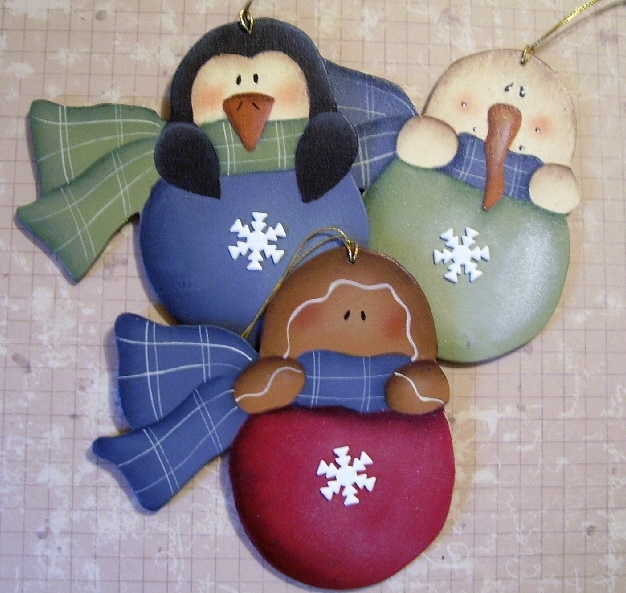 Thanks Marie, these were fun, quick and cute to paint, love that snowflake brad. And this is a Halloween swap I received from Donna my partner from the Altered Paper Halloween swap hosted by the wonderful Tee. Donna sent me these 2 lovely ATC's along with the fab little envies she made to tuck them inside and some wonderful ephemera for other projects. 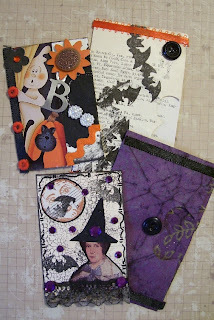 If you drop by Donna, thanks so much, I love them and making ATC's were fun, haven't done that in ages. I really miss it. 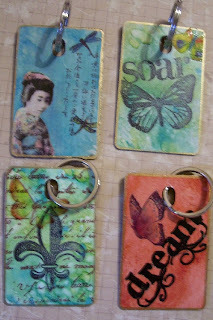 And over at Bella Creations there was a challenge to stamp on a non paper surface, so since I am going key chains for the scrapbook store and maybe a class in October I thought why not kill 2 birds with one stone and make a challenge and stock up. I used alcohol inks, StazOn inks, images,rub ons and an Asian image I had in my stash. Any time I can do anything oriental I do.The STazon really doesn't like the alcohol inks so I had to stamp after I did the AI as it made the StazOn bleed. The Dream key chain I actually stamped then used a permanent marker to make it really black. I used Stream, Lettuce, Cranberry and Butterscotch AI's to colour these. I like the translucent effect from the rub ons on top of the colours. I hope I am able to sell a few of these, they are fun and so useful. And one final picture to show you. My dear hubs is a great photographer, he often takes pics of the yard which he is quite proud of, he loves it outdoors and gardening, a real natural green thumb. Anyways to my surprise he took these morning glories the other day along the rail fence near the veggie garden, I just love that blue. Til next time, thanks for dropping by and as always I love to hear your comments. 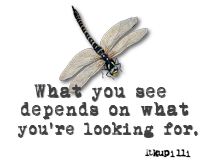 I can't always drop by your blogs and some I do and don't leave comments but I will be back in action soon. 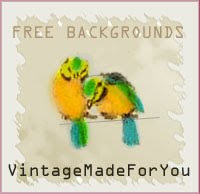 Take care and be creative. those ornaments are great. 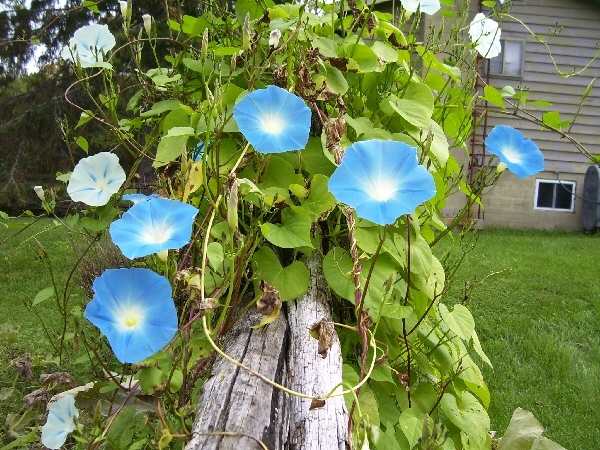 Love the photo of the morning glory. Quite hard to capture blue, it often goes a funny colour I find when you take a photo of it. 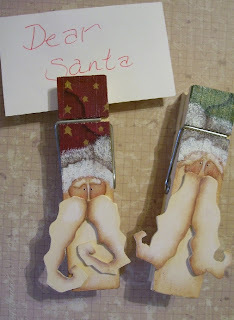 How fab are your santa clothespins :) -lovely creations! Loving that shade of blue of your flowers too! The ornies turned out so nice Les!! You did a fantastic job and I also love your santa clothespins, keychains and your morning glories are beautiful. Can I post the ornies on my show and tell??? Love the snowmen and the Santa's. Your flowers are lovely too !